City Arts is a platform for arts and culture in the Seattle area. From 2006 to 2018, it produced a monthly print magazine as well as regular online content and a suite of events—all of which were designed to support and the local creative ecosystem. By telling the stories of this place, City Arts helped the community to better know itself and shared our culture with the world. Our writers and photographers were committed to reporting on the grassroots. Together we sought out and highlighted people making compelling work—not just the established artists and thinkers, but also the ones who’ve never been covered in the media before. We offered professional criticism rooted in a deep knowledge of craft. And we built bridges among the many active creative disciplines and genres, using our platform as a place to convene artists and audiences of all stripes—from fine art to street art, garages to proscenium stages. Every day we painted a portrait of the community as a complex whole, a living organism. Founded in Tacoma in 2006, City Arts began as a product of Encore Media Group, a family-owned, Northwest-based custom publishing company. 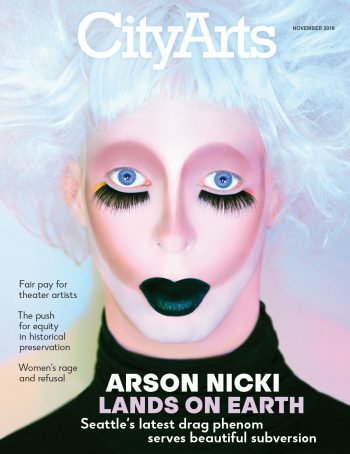 Encore published the magazine until June 2018, when City Arts became an independent social purpose company. In November 2018, the magazine ran out of funding and ceased publication, letting go of its longtime editorial staff. Efforts are currently underway to sustain City Arts in some fashion, such as a smaller all-digital platform.